CEDAR CITY — This coming weekend marks the 10th annual Steve Hodson Cancer Classic, a three-day high school hoops extravaganza staged on six courts at three different Cedar City secondary schools. Boys and girls squads from approximately 20 Utah high schools are scheduled to play some 77 basketball games during the event. Canyon View High’s boys varsity team will open their tournament play against Carbon at 7 p.m. Thursday at CVHS’ main gym. The Falcons will also play San Juan Friday at 6:30 p.m. and Stansbury at 3:30 p.m. Saturday at the same location. Meanwhile, across town at Cedar High, the Redmen boys varsity team will host Stansbury at 6:30 p.m. Friday and Uintah at 12:30 p.m. Saturday. Those two host schools are the only Region 9 boys varsity teams participating in this year’s Hodson Classic tournament, although Desert Hills, Hurricane, and Crimson Cliffs will be taking part in several sub-varsity contests staged in the high schools’ auxiliary gymnasiums, as well as at Canyon View Middle School. Additionally, Canyon View’s girls varsity team is scheduled to play Grantsville at 5:30 p.m. Thursday, Tooele at 5 p.m. on Friday and North Sevier at 5 p.m. Saturday. All three contests are scheduled to be in the main CVHS gym. Cedar High’s girls varsity team is also scheduled to play one game each day on its own home floor. The Lady Reds will take on Juab at 2:30 p.m. Thursday, followed by Grantsville at 5 p.m. Friday and Stansbury at 2 p.m. Saturday. 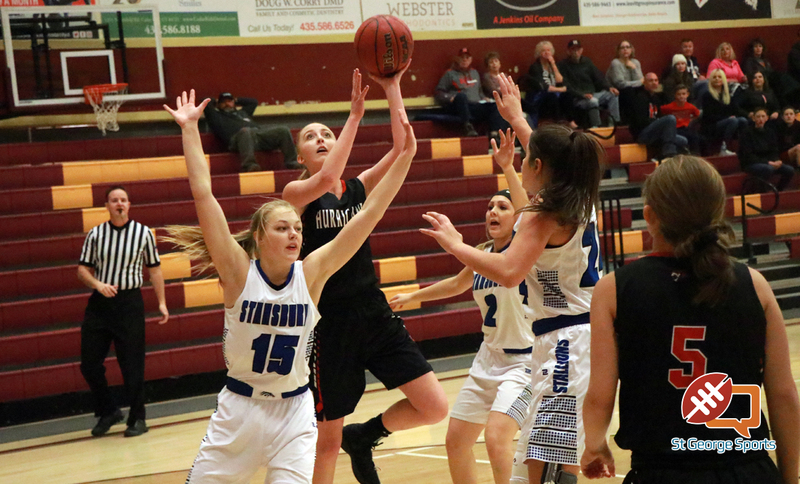 Also from Region 9, Hurricane’s girls varsity team is scheduled to play Lehi at 11:30 a.m. Thursday and Stansbury at 2 p.m. Friday, with both contests scheduled at Cedar High’s main gym. The Hurricane Lady Tigers will then play Grantsville at 11 a.m. Saturday at Canyon View High’s main gym. Rounding out the Region 9 participants, Dixie High’s girls varsity team will play Stansbury at 2:30 p.m. Thursday, Lehi at 2 p.m. Friday and Bryce Valley at 2 p.m. Saturday. Other Southern Utah squads scheduled to participate this year include the Parowan High girls and boys teams and the Panguitch High boys. 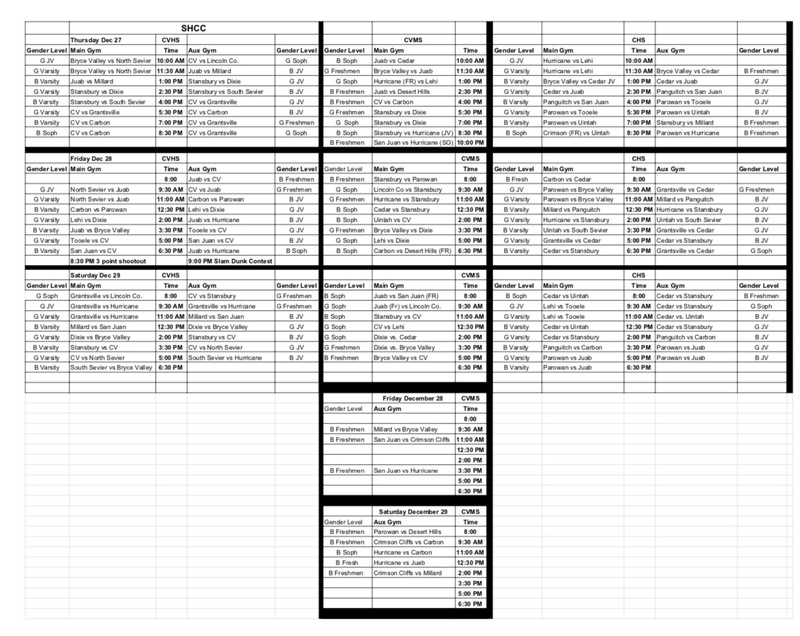 Click here for a schedule of this year’s games in spreadsheet form. Note that the action at each venue typically alternates between boys and girls games. The popular year-end tournament, hosted jointly by Canyon View and Cedar high schools, is named in honor of Steve Hodson, who coached basketball at both schools, in addition to a stint at Southern Utah University. After Hodson died in November 2008 of multiple cell myeloma, organizers created the tournament as a tribute to him, and to serve as a fundraiser in the fight against cancer. The event typically raises several thousand dollars each year, with the proceeds going to benefit two or three local cancer survivors and their families. Admission to the games is $5 per person per day (good for any and all venues). Patrons are encouraged to donate more if they are able to do so. The tournament is almost entirely staffed by volunteers, who do everything from taking tickets to serving as official timekeepers. After Friday night’s games at Canyon View High, the event’s popular 3-point shootout contest will take place at 8:30 p.m., followed by the slam dunk competition at 9 p.m.
For more information about the Steve Hodson Cancer Classic and its history, click here.